Experience one of the most beautiful and dramatic coastlines in the world, the Amalfi Coast, accessible from the port of Naples. Caesar, our driver, picked up our small group of 8 at the pier in Naples. Picked us up and dropped us off. Picked us up and dropped us off. Took us to see Ravello, Amalfi & Positano along with guided narrative about area. Highly recommend it!! Breathtaking view along the coastline. Breathtaking view along the coastline. We ate lunch in this nice Italian restaurant that overlooked the beautiful blue waters of the bay. Wonderful. A drive down the coast to Amalfi with time to walk around there (too much time actually). Great driver picked us up on the pier. Great driver picked us up on the pier. Driver had good knowledge and did a good job to get us to around Amalfi Coast. Booked a tour in advance after checking out some options prior to travel. Fantastic tour, the guide was very informative, driver was very good and funny. Fantastic tour, the guide was very informative, driver was very good and funny. The meal provided was above expectation. All in all a great experience. I&apos;ve used Viator before and have never been dissatisfied. The ship was 45 mins late and took 1 hour and 1/2 to clear. Enrique gave us a great tour to Positano. 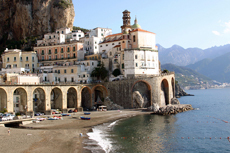 We booked a tour with Italytours.EU of Pompeii, Sorrento & Positano. 4 hours in crazy (truly, mind-bogglingly insane traffic). 4 hours in crazy (truly, mind-bogglingly insane traffic). 1 hour in Amalfi, where we were constantly in fear of being run down by autos whizzing through narrow, overcrowded streets. No time to eat or really shop. Highly disappointing. Our driver did a wonderful job driving on the Amalfi coast and then to Sorrento. Our driver did a wonderful job driving on the Amalfi coast and then to Sorrento. He was very accomodating, stopped whenever we asked. He tood us to a wonderful restaurant. Ton of fun and food was excellent, go on this one, perfect and just outstanding. 8 hour tour of all 3 places ..
8 hour tour of all 3 places .. it was GREAT . .
Can not tell you how much we enjoyed this tour. Great drive out to overlook of Positano. Great drive out to overlook of Positano. Cliff top roads. Wow! Seriously exceptional driver / tour guide. Scared at times with the bus traveling on these small roads, but the driver was very adept at his trade. BEAUTIFUL!!! !